Is there an app to turn your iPhone into a Walkman too? Even the most nostalgic owners of the Apple Watch will appreciate one the first-ever 'smartwatches' to come onto the market. 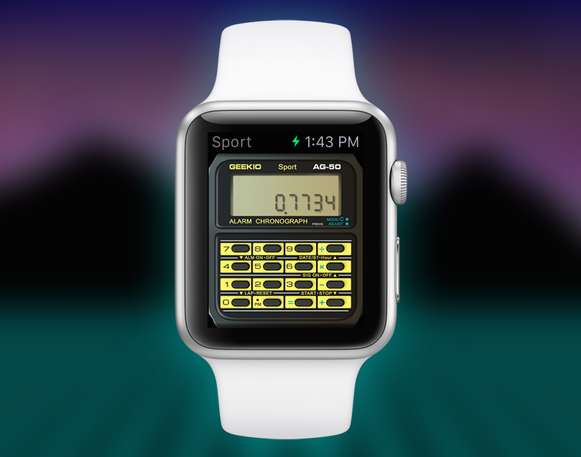 The Casio Databank was THEsmartwatch of the '80s and now you can turn back time and emulate the device on your shiny new Apple Watch thanks to a new app. Dubbed Geek Watch, the app is for the iPhone or iPad and comes with a companion app for the Apple Watch. It turns your normal display into a retro calculator watch, complete with tiny buttons and an LCD screen. You will have to put up with it displaying Geekio instead of Casio, though - legal reasons, natch! - but that doesn't matter when you can add, subtract, divide AND multiply numbers all through the retro app. The interface can be changed with different options for colour and screen lighting. The only thing you can't do with the new watch face is tell the time, as Apple doesn't allow that kind of customisation unfortunately. By trying to spell words on the calculator, the app also unlocks some goodies. Sure, it's a novelty, but at 79p, you will still have enough pocket money to buy some Space Raiders from the newsagent before riding home on your Rayleigh Grifter to watch Back to the Future.